Amazon only relays messages that are sent from email addresses that have been verified. This documentation from Amazon has all of the steps necessary to verify the specific From and Sender email addresses. Amazon SES does not recognize the VERP method GreenArrow uses to encode the variable part of the bounce address. This means that, to Amazon, every message that GreenArrow sends has a unique bounce address that needs to be verified. Because of this, we recommend verifying GreenArrow’s Return Path address by verifying the whole domain you’re using in the Return Path address. This documentation from Amazon has all of the steps necessary to verify a domain. NOTE: If domain verification is not possible then there is a more complicated alternative method to verify the Return Path address (including GreenArrow’s VERP portion) using Amazon’s wildcard feature. This method is described in the last section of this document. Since Amazon SES is the MTA handling the final delivery of your emails, all bounces and spam complaints will be directed back to them. By default, this leaves GreenArrow without any knowledge of a bounce or spam complaint ever happening. If you would like GreenArrow to receive a copy of any bounce or spam complaints, you will need to set up Amazon SES Notification Through Email. We recommend thorough testing of bounces and spam complaints after setting up Amazon SES as a relay. Only use the following verification method when domain verification is not possible. GreenArrow encodes information about the subscriber and campaign in the Return Path, using Variable Envelope Return Path (VERP). To separate the base from the sub-address (the variable portion) in the localpart, GreenArrow uses a - character. Amazon recognizes + as the separator between the base address and sub-address. By creating a bounce mailbox in Engine that ends with a + character, GreenArrow will set the Return Path to an address that has a + between the static and variable portions of the address, which will be a valid VERP address on Amazon. Then it’s just a matter of following the instructions to verify a single email address, with the bounce mailbox email address without the + sign. 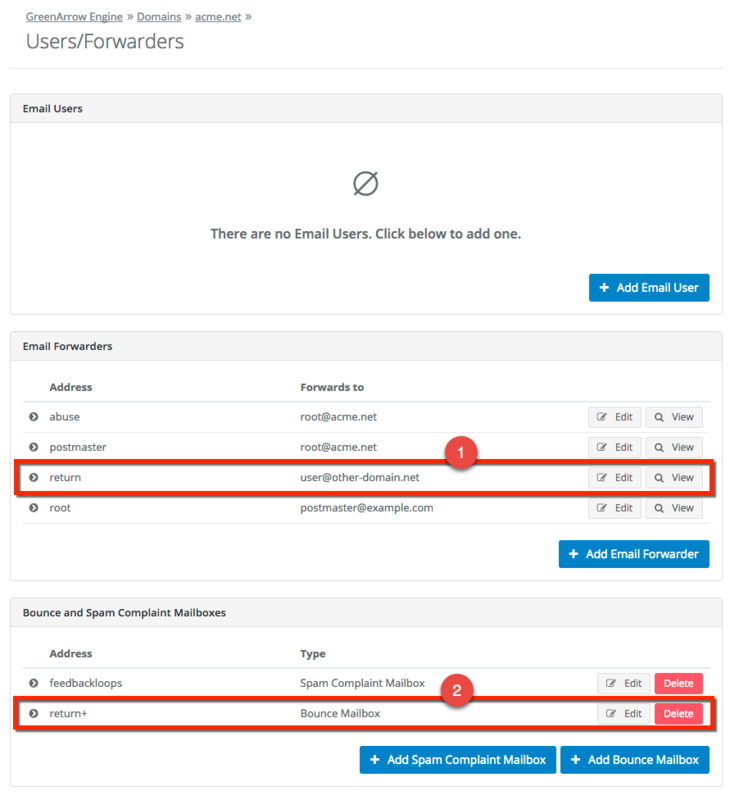 Create an email forwarder with the localpart but without the + character that forwards to a mailbox that you can access - this is where Amazon will send the verification email (e.g. [email protected]). Thoroughly test bounces and spam complaints as explained in the section above. These must be updated with the new bounce address, that includes the + character. In the example, the bounce address is [email protected] (2) and the forwarder [email protected] (1) was created to forward Amazon’s verification emails to [email protected]. The forwarder can be removed after verifying the bounce address.